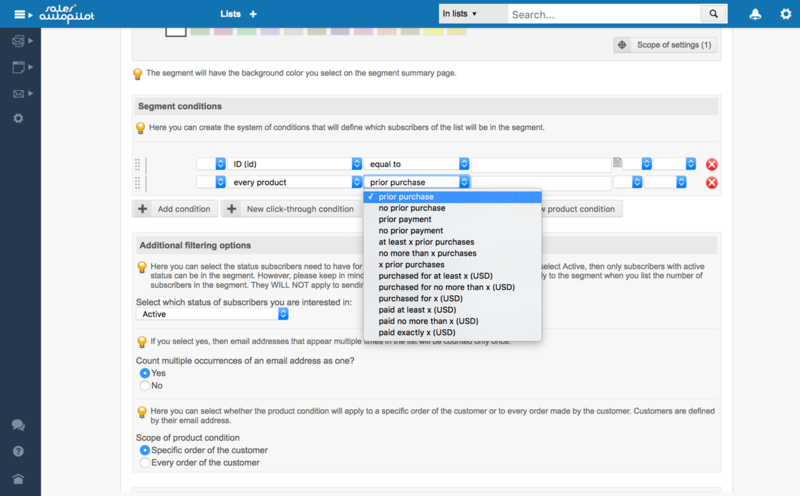 If you have at least one order list, then you can segment any of your mailing lists based on the products ordered. For example, you can create a segment for those customers who have already ordered a certain product or for those who have not ordered any products. 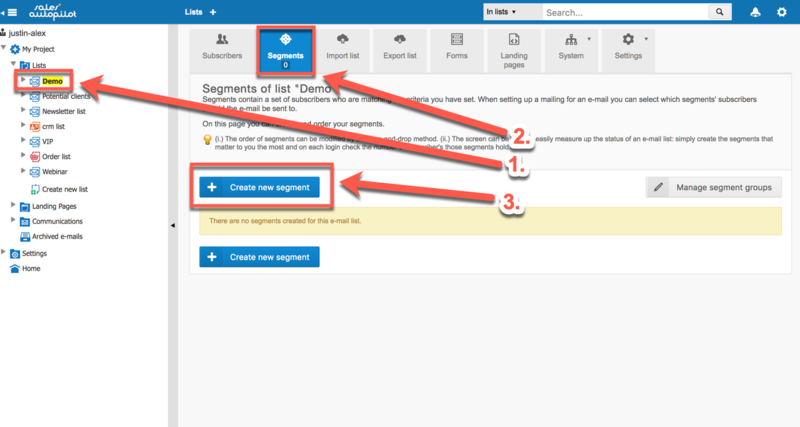 Select the list you would like to segment, click on the Segments tab, and then click on the "Create new segment" button. 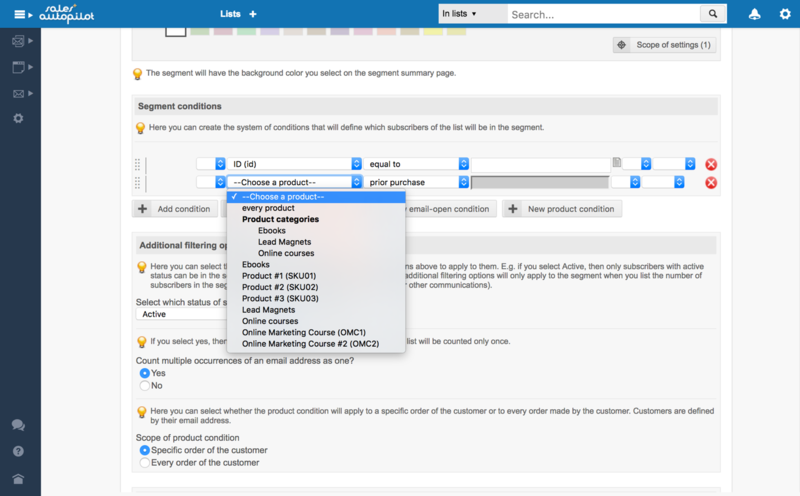 On the Create new segment page, go to the Segment conditions sections and click the New product condition button to add a product related condition. Use the first dropdown to select the product or product category you want to use for the product condition. Use the second dropdown to select the type of condition. at least x prior purchases: at least x prior purchases have been made with the given email address. This is how you can distinguish between one-time buyers and multi-buyers. no more than x purchases: no more than x prior purchases have been made with the given email address. x prior purchases: exactly x purchases have been made with the given email address. purchased for at least x: the monetary sum of all prior purchases made with the given email addresses is at least x.
purchased for no more than x: the monetary sum of all prior purchases made with the given email address is no more than x.
purchased for x: the monetary sum of all prior purchases made with the given email address is exactly x.
paid at least x: the monetary sum of all payments made with the given email address is at least x.
paid no more than x: the monetary sum of all payments made with the given email address is no more than x.
paid exactly x: the monetary sum of all payments made with the given email address is exactly x. The system uses net prices without shipping cost to measure monetary sums (i.e. for all nine conditions just listed). Important to note: orders will be assigned to customers based on their email address, not their name. For example, if you select the "purchased for at least x" condition, the orders of every customer with a given email address will be added (even if different names were entered for each order). If you are creating a segment or condition for an order list, then you can also set the scope of the product condition. In a specific order of the customer:the software will only check if the conditions are met by a specific order of the customer. 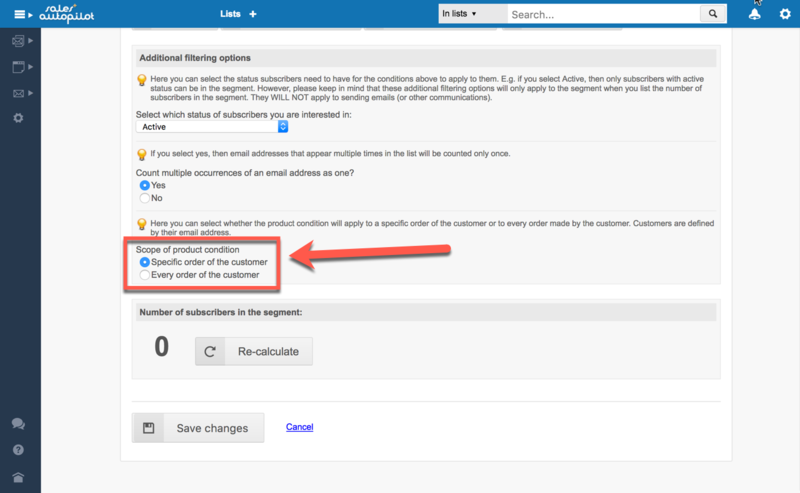 If the conditions are met by another order with the same email address, but they are not met by the selected order, then the conditions will be considered not met. Every order of the customer:the software will check if the conditions are met by any order made with a given email address in the order list. 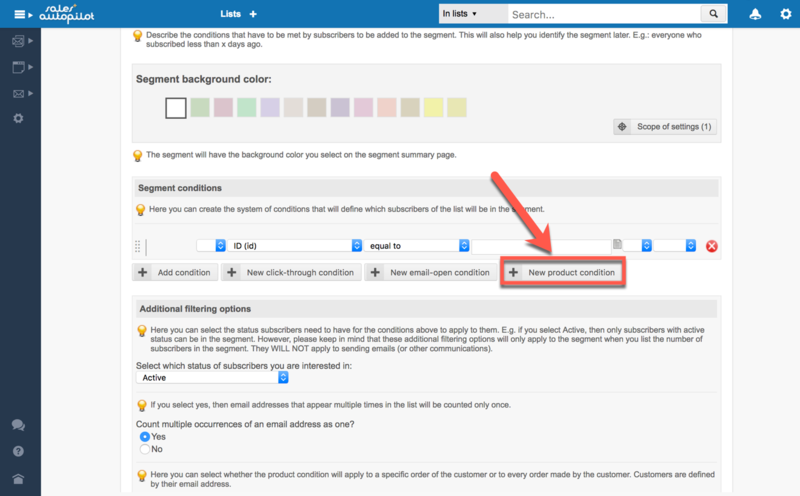 Product conditions can be combined with regular conditions, click-through conditions, and email-open conditions. Please keep in mind that calculating the subscribers/orders may take longer when your list has a lot of orders/subscribers, or when your segments have very complex conditions.